The Carotron Voltage to Pressure Transducer, Model PTEE01, accepts an electrical input signal, 0-10VDC, and converts it to a proportional output pressure. Model PTEE01 is a single loop unit consisting of valves, manifold, internal pressure transducer, and electronic controls. Pressure is controlled by two solenoid valves. One valve functions as inlet control, the other as exhaust. The pressure output is measured by a pressure transducer internal to the PTEE01 which provides a feedback signal to the electronic controls. This feedback signal is compared against the command signal input. A difference between the two signals causes one of the solenoid valves to open, allowing flow in or out of the system. Accurate pressure is maintained by controlling these two valves. Each unit also comes standard with a monitor output that can be used with a meter or data acquisition needs. 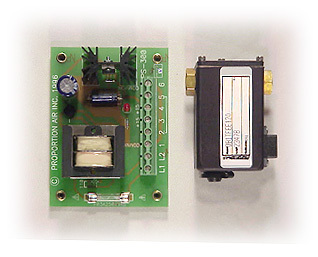 The 0-10VDC signal is from the internal pressure transducer. Available accessories for this voltage transducer include a 15VDC, 300mA power supply and mounting bracket.